At long last, here is a complete description of how I made Crustardes of Flessh for KASC back in March, including recipes and quantities. Enjoy! 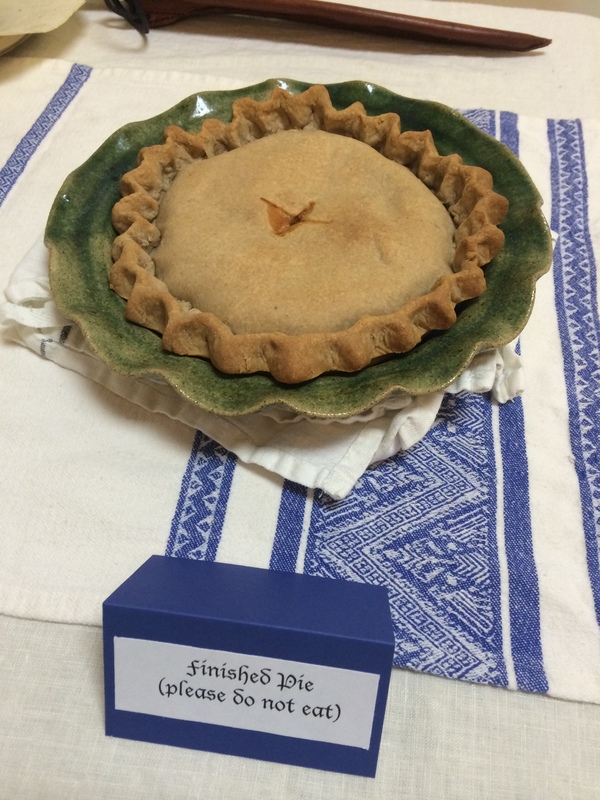 This is the finished pie that I served my judges on Saturday. The one I had for Sunday looked even better, but I didn’t get pictures of it. De-bone the meat and mix with other filling ingredients. Prepare pastry, roll out bottom crust and line baking dish, place meat mixture within. Mix eggs with the cooking liquid from the birds. Pour over meat mixture. Roll out top crust, place over filling. Seal and crimp edges. Cut a vent in the top. Bake. Allow to cool at least slightly before serving. Roast oxtail pieces in a single layer at 425°F for 30 minutes, until browned. Place oxtail in a slow cooker, sprinkle with salt, and cover with water. Cook on low for approximately 12 hours (or overnight). This is only one possible version of beef broth (or stock) for use in medieval English recipes. I found that the natural gelatin present in this version improved the texture of my pies. Additionally, it produces grease which can be used to augment the birds as they cook. For the quail, since they were mostly deboned I simply quartered them. For the poussin and the squab, I removed the backs and wing tips, then removed and jointed the wings and legs. I then removed the breast meat from the bones to simplify the later processing. Discard backs, wing tips, and excess bones. Arrange the bird pieces in a slow cooker or a sturdy pot with a lid. Add the grease, verjus, and spices. Once the cooked meat has cooled, use a slotted spoon to remove the pieces from the cooking liquid. Strain and reserve the cooking liquid. Carefully remove and discard all bones from meat. This is a rather arduous process as both the pigeon and quail have very small bones that are easy to overlook; it helps to feel each piece of meat carefully, work only a small amount at once, and maintain a separate bowl for the finished (deboned) pieces. I also removed ligaments, skin, and any pieces with inconsistent or unpleasant textures. Mix and lightly shred meat as you work. After cooking and deboning, the total mass of bird meat that this recipe yielded was 12 ½ ounces, and the total volume of cooking liquid (after straining) was 2 ½ cups. Place the flour in a heat-safe bowl, making a well in it. Separate the dough into two pieces, one roughly twice the size of the other. Roll out both portions of pastry on a lightly floured surface to between ⅛ and ¼ inch thick. Use the larger piece of pastry as a bottom crust, lining the pie dish (trap); set aside the smaller piece for a top crust. Note: This recipe works better when the dough is kept warm. Mix meat with currants and spices and place in pastry-lined pie dish. Arrange as a single loose layer. Place a double layer of cheesecloth over the top of a bowl or glass measuring cup. Break two eggs into the cloth. Gather up the sides and squeeze the eggs through the cloth. Whisk the cooking liquid into the eggs. Carefully pour ONLY as much of this liquid into the filling as will cover the meat; do not overfill the pie. I found that my pie dish would hold about ¾ cup of the egg-broth liquid. Lay the reserved piece of pastry over the filled bottom crust and seal/crimp the edges of both crusts together. To make a fluted edge, use the forefinger and thumb of one hand on the inside of the edge and the thumb of your other hand on the outside. Cut a slit or make a hole in the top to allow steam to vent. Option 1: 350°F for 75 minutes or until crust is browned. Option 2: 400°F for 20 minutes, 375°F for 20 minutes, and 350°F for 20 minutes. If need be, extend final cooking time until crust is browned. I love the herbs that you put in your meat-pie…..I would have put marjoram and sage and garlic, type of thing, but I love the way you thought of putting ‘finely minced mint, nettles, redwood sorrel, fiddleheads, and lemon balm, chopped them finely, and mixed them with the lamb’. I will try those next time I make a meat-pie ; I grow all these in my garden. I was definitely constrained by what I was able to find in the forest!